It’s safe to say Columbus area football fans have probably had their fill of Wyatt Mazour and the Boone Central/Newman Grove Cardinals for a while. Nothing personal, mind you, but Friday nights for Columbus schools should be more successful with Class C1’s #1 ranked team in the rearview mirror. One week after burning Scotus with 415 total yards and four touchdowns in a 31-14 Card victory, Mazour again had a hand in four scores to pace BC/NG to a 43-16 conquest of the Lakeview Vikings Friday. Although Mazour’s personal carries and pass attempts were limited as Boone Central/Newman Grove worked on other facets of its attack, the senior all-stater still totaled 203 yards, rushing for three touchdowns and passing for one. “We were pleased we made fewer mistakes that could hurt us down the road,” Johnson commented. “We played a little sharper than the week before. Our goal was to play a little better and we did that. Much of that improvement came in a running game that had sputtered against Scotus except for Mazour’s improvisations. With the Card offensive line and fullback Colton Pelster paving the way, halfback Joseph Brugger got the brunt of early work, carrying seven times on a 10-play touchdown march. Brugger banged for first downs to the Viking 42 and 30 and, after Mazour connected with Keaton Henry for a 12 yard gain, burst 16 yards for the score. Matthew Brugger’s PAT made it 9-0 with 6:41 remaining in the first quarter. BC/NG stayed with Brugger and the I on its next possession – until Mazour put a little wrinkle into things. After Brugger carried three times for 20 yards and a first down, Mazour dropped to pass, saw an opening on the left side, squirted through several Lakeview defenders, then cut across the entire width of the field to finish a 36-yard TD gallop down the right sideline. Matthew Brugger again added the PAT for a 16-3 BC/NG lead. With Lakeview’s defense focused on the run, Cardinal split end Travis Kennedy broke free behind the Viking secondary, snared Mazour’s aerial with one hand and raced to the end zone untouched to complete a 71-yard touchdown. Less than a minute later, Kennedy intercepted a Johnson pass and – boom! 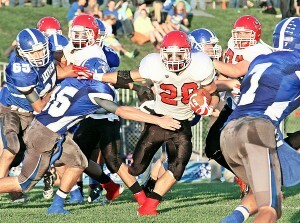 – Mazour followed with another highlight-reel run of 58 yards for Boone Central/Newman Grove’s fourth touchdown. Brugger again booted the PAT to give the Cards a 30-3 advantage going into intermission.